I went all the way back to page 8(because Heaven knows, I ain't checking all 21 pages), and I didn't see a musical posters gallery. I think musicals have the most fun posters, so I thought I'd start a gallery. If you have one you'd like to post, by all means, stick it up here! This was inspired by Whistlingqypsy, who started the "Silent Film Gallery" that I enjoy so very much! 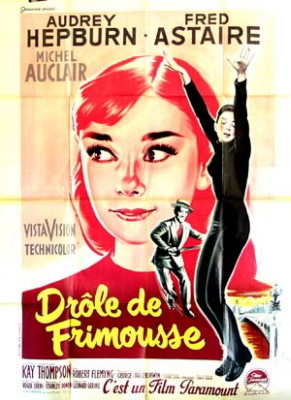 And to start it off, the most recent musical I have watched: *Funny Face* This is the French poster no doubt. 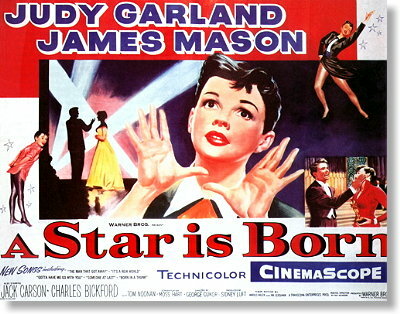 In my opinion, *A Star Is Born* is Judy's best film! She truly gave an Oscar _deserving_ performance! Miss M- what a fun idea. I only own one actual movie poster--not a musical--but I just love the artwork that goes into those things. Are these from your own personal collection? Thanks for taking an interest Actually no, these particular ones aren't. But I was just recently given posters for Breakfast At Tiffany's, A Star Is Born, Casablanca, Wizard of Oz, and a LIFE SIZE picture of Bogie and Bacall in To Have and Have Not. I was so excited I about fainted. I hauled off to Hobby Lobby to get them matted and framed. So, I was a little inspired to get a poster gallery going. Wow--nice collection. aMaybe I can persuade you to post the Wizard of Oz???? There were a bunch more than just these. This one's kinda funny looking. Judy looks a bit deformed. I've never been an Indy fan myself. Actually, I've never seen any of Indiana Jones films, but I don't really feel the need to. For some reason, everything about the 80's depresses me. I don't know why. It's a strange feeling, so I try to stray from 80's stuff. Of course, there's nothing wrong with that decade, I'm just messed up in my head. Haha. Haha, I've been told I am a quick responder. Aww, I love when young'ns enjoy the classics. When I was between the ages of 5-9, every time I went to my grandparents house(my Grandpa being a huge classic film lover) I'd head for his collection. I'd watch *The King and I* , *South Pacific* , *Oklahoma! * , *Our Gang* , *Carousel* , and my favorite... all the *Shirley Temple* flicks. I thought she was just the coolest little girl I ever saw. I wanted to meet her and be her friend, and play dolls, and try animal crackers in my soup, and go on the good ship lollipop! Anyway, that's how I got started with old movies. I found one... hopefully it won't pull the little red "X" on me. Yes'um! Texas born and Texas bred! Thanks very much, I try to post as soon as you request 'em. Well now, I don't know about the million bucks thing. I'm dirt poor so to speak So we'll stick to posters, because Heaven knows I ain't got money to spare. Haha. I've never gotten to see this film all the way through--but I have seen the ending---twice! ( I love how you typed your post in lovely "easter egg" yellow! :-) Someday maybe I will get to watch it all the way from start to ending. Oh thanks! I try to match the font with the poster. I think I'm doing a pretty good job. Fort Worth ay? I've never been there. I've been to the big cities such as Dallas, Austin, and Houston(live 45 minutes away), and I've been to the po-dunk little towns such as Orange. Oh gosh! Orange was the absolute worst town I have ever been to. On a family vacation once, my family and I were heading to South Carolina to visit some friends, and we blew a tire(with a family of 8... we didn't buy plane tickets.) just as we crossed the Louisiana border. We sat on the side of the road for 30 minutes and finally a police and a tow truck showed up. My younger brother, my father, and I hopped in the tow truck, and my mother, younger sister, and 3 younger brothers piled into the police car. There was only one place we could get a tire, and it was in the teeny, nasty, depressing little town, Orange. We got to the auto repair shop, only to discover that they did _not_ have a tire to fit our big ol' honkin' van. They told us they had to drive some 2 hours to get us a tire. We ended up spending 6 hours there waiting. We wasted time touring an old submarine, visiting the local library, and sitting in the office at the repair shop eating donuts, and watching the news. Not a fun experience. Gotta agree--if you can even post anything on here with pictures in it, you are doing better than me-I don't have the slightest clue about such stuff--or where to even go to get the pictures. But I am enjoying all the folks who do. Orange was the absolute worst town --hey couldn't be all bad, now. At least you got to eat donuts!! :-) I always try to find the brightside if there is food involved. How about my other fave musical star....Got any Doris Day??? Oh, Fort Hood? Well, that's even better... never even heard of that. Haha. Now... I'm off to find some Doris... the wonderful Doris of Day! *The Pajama Game* I've never seen this one, have you? Yes I think I have--but a VERY long time ago. I used to love catching her movies on the old Sunday afternoon matinees on tv or the late-late show. I haven't seen Calamity Jane in about a zillion years either but still recall how she belted out "Secret Love" I think I like her best in her some of her early ones--On Moonlight Bay and By the Light of the Silvery Moon.....oh and I LOVE Move Over Darling--though that one is not really a musical. *Moonlight Bay* Looks like Doris signed this one. *By the Light of the Silvery Moon* Another Doris film in which Gordon McRae co-stars, and the word "moon" shows up in the title. I LOVE The Pajama Game! The stage show even more than the movie. And Doris was the perfect Babe. I wish Doris had played Nellie in South Pacific...Mitzi was good but Doris would have been amazing in my opinion!